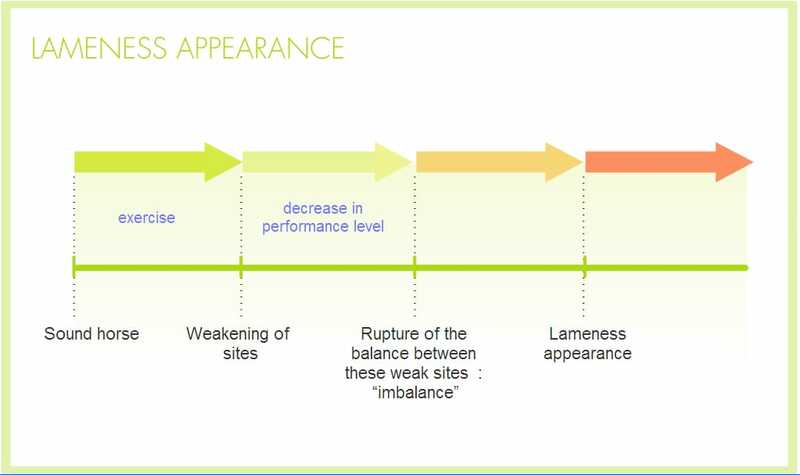 Home > Tildren > The impact of lameness > The cause of lameness > How does lameness appear? DODDOD: Developmental orthopaedic disease i.e. skeletal disorders appearing during growth. The main condition is osteochondrosis. : Developmental orthopaedic disease, which develop whilst the skeletal system is still growing. The main is osteochondrosisA DOD, a growth disorder that is manifested by damage to the cartilage and underlying bone. WREIDWork-related exercise-induced disorders, i.e. a condition induced by work, and specific to the horse's activity. : work-related exercise-induced disorders, associated with the type of event in which a horse takes part. These are work-related disorders. For example, a show-jumper will be predisposed to the development of degenerativeCaused by wear, and associated with activity, work or ageing. diseases with age, such as navicular syndromeNavicular disease, podotrochlear syndrome or interphalangeal arthropathyPathological condition in a joint..
A trotter will be more susceptible to damage in the suspensory ligamentFibrous structure connecting two bones. or problems in the hock. Finally, it is unusual for a racehorse to end his career without having developed tendonitis or fetlock damage. Even with a reasonable workload, competition horses are subject to major physical stresses of a repeated nature. DegenerativeCaused by wear, and associated with activity, work or ageing. osteoarticular conditions in the horse are therefore far from being associated solely with work and sporting events. Predisposing factors play a part in accelerating the appearance of damage: poor balance, shoeing and trimming, the ground on which the horse is trained, etc. But the main cause of skeletal and soft tissueAny tissue that is not bone (tendon, muscles, vessels, nerves, etc.). disorders is still ageing. A horse kept for hacking or in only light work will also suffer degenerativeCaused by wear, and associated with activity, work or ageing. conditions that cause lameness.